Diabetes is a global epidemic that affects everyone. The numbers are staggering: 415 million people were living with diabetes in 2015, another 318 million people were at high risk of developing type 2 diabetes, and diabetes was responsible for five million deaths. And the number of people living with diabetes is expected to reach 642 million by 2040. In view of these alarming statistics, it is clear that current policies are not doing enough to tackle the problem effectively. Politicians and policy makers around the world recognise that diabetes, particularly type 2, which accounts for over 90% of cases, is a global crisis that is having a devastating impact on individuals and societies. Yet, despite this acknowledgement and the recognition that national strategies are required, not enough is being done to tackle the crisis through the implementation of effective policies. It is imperative that we do not lose more time in closing the gap between evidence, policy and practice. Prevention: taking steps to prevent people from developing type 2 diabetes from the outset. Early Detection: identifying those at high risk of developing type 2 diabetes and diagnosing them as early as possible. Early Control: ensuring that people with diabetes are given the treatment and support they need to achieve good control of their blood glucose levels as early as possible, to reduce the risk of complications. Early Access: ensuring that health systems are addressing the need for equitable, early access to the personalised education, lifestyle change programmes and treatments that people with type 2 diabetes need. These four pillars are firmly rooted in the evidence base on what is most valuable in reducing the economic, societal and personal burden of type 2 diabetes. In December 2016, diabetes experts representing 38 countries convened in Berlin, Germany to launch The Berlin Declaration, a global call to action urging policy makers to reduce the growing burden of type 2 diabetes. The document consolidates the findings of four International Working Groups, each tasked with reviewing the latest best practice in policy making in each of the four areas and identifying the key early action principles that need to be urgently adopted to drive improvements in patient outcomes. The Declaration’s purpose is to help countries narrow their focus on the policies most likely to benefit their populations, supporting them to measure progress as part of an international movement for change that seeks to truly transform individual health and wellbeing. Excellent work has been started at the international level to raise awareness of the diabetes challenge and initiate action and, in several countries, national plans are already in place to try to tackle the burden of type 2 diabetes. The Declaration seeks to build on this work by supporting the development and implementation of tangible, action-orientated targets in the short, medium and long term. Where effective national plans are in place, the Declaration should act as inspiration for implementation, translating the evidence into action. Where they are yet to be formed, it can inform a plan based on international best practice, to ensure that these ambitions are translated into actions that positively impact the lives of people in each nation. 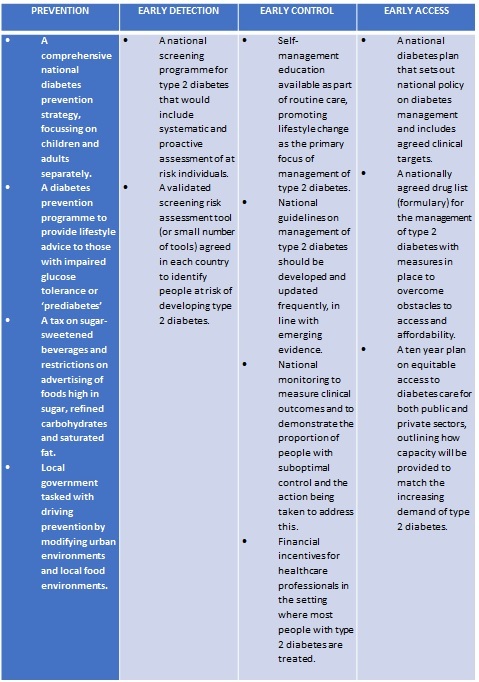 If adopted by national health systems, the recommendations are expected to help countries meet voluntary global diabetes targets set by the United Nations and the World Health Organisation. These include a global reduction in premature mortality from diabetes of one third by 2030 and a 25% reduction in the frequency of diabetes-related complications detected at diagnosis. 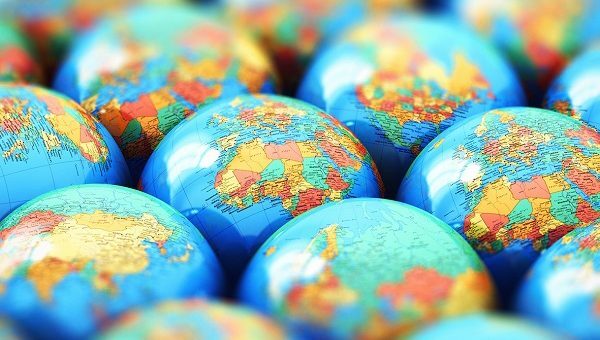 Experts from different countries have developed the Declaration based on principles gathered through their own experience that are likely to be applicable in other countries, cultures and systems. International in its scope, it is therefore relevant to all nations, regardless of their environments and designed to allow localised, national plans to take root and deliver change. Every six seconds, someone in the world dies from diabetes. This sobering fact makes it critical that policy makers take immediate action, and that a broad range of stakeholders come together to encourage and support needed policy reform. With the practical solutions outlined in The Berlin Declaration and the commitment of national governments to ensure the capacity to implement them, we have the potential to change the diabetes landscape to achieve a healthier future for all.Successful prevention of type 2 diabetes will only be achievable through concrete and effective action at the community level. What sets Early Action in Diabetes apart from other campaigns is its focus on real action on the ground, aimed at producing concrete benefits for people with diabetes in countries at all levels of income. 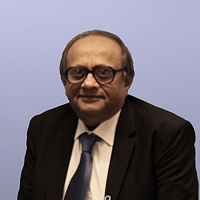 Dr Shaukat M Sadikot is President of the International Diabetes Federation and Editor of the International Scientific Journal Diabetes and the Metabolic Syndrome: Clinical Research and Reviews. He has written four books and has 87 publications to his credit. The Early Action in Diabetes initiative is funded by AstraZeneca, and organised in collaboration with the International Diabetes Federation (IDF), Primary Care Diabetes Europe (PCDE), and the World Heart Federation (WHF). The Berlin Declaration was funded by AstraZeneca and produced in collaboration with the International Diabetes Federation (IDF), Primary Care Diabetes Europe (PCDE), the World Heart Federation (WHF) and German Diabetes Aid (GDA). This article was written by the International Diabetes Federation (IDF). AstraZeneca has reviewed this article for the purposes of ensuring regulatory compliance.